A Memorial Visitation for Blanche M. Piotrowski (nee Pokorny), 95, of McHenry for 30 years, will be held Wednesday, February 13, 2019 from 9:00 a.m. until the time of the Memorial Mass, 10:30 a.m. at the Church of the Holy Apostles, 5211 Bull Valley Road, McHenry, IL 60050. Inurnment will follow at St. Mary’s Cemetery, McHenry. 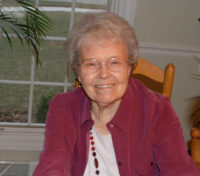 Born February 25, 1923 to the late James F. Pokorny and Dominique (Minnie) Markman; she passed away February 7, 2019 in Lake Barrington. She worked at Chicago, Burlington & Quincy Railroad and later on LaSalle Street at Chicago National Bank. Blanche was married to Casimir (Casey) Piotrowski on May 30, 1947 at St. Epiphany in Chicago. Her husband accepted a position on Long Island, N.Y. where she resided for 12 years enjoying golf and competitive bowling. Upon their return to Illinois, they settled in Hinsdale, Illinois. She joined the Hinsdale Hospital Auxiliary escorting tour groups through the hospital and operating the book look cart. In retirement they settled in McHenry, Illinois. She joined the Northern Illinois Hospital Auxiliary and volunteered at the Pink Door Thrift Shop for many years. Volunteering at the F.I.S.H. Pantry and joining the church prayer group were another couple of her commitments. Her utmost enjoyment was playing bridge and beating her grandchildren at cribbage. She was the beloved wife of the late Casimir; loving mother of James (Kim) Piotrowski; loving grandmother of Kristen Piotrowski, Brian (Krista) Piotrowski, Kevin Piotrowski and Justin Piotrowski; fond sister of the late Sylvia Cerny.